This was once a temple. 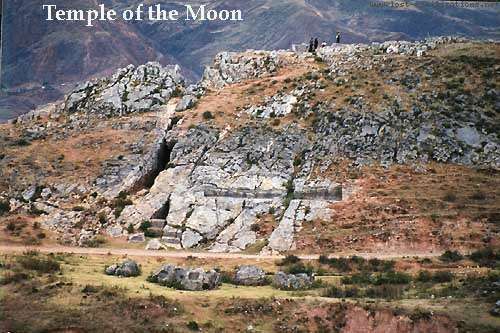 A huge mysterious door-like structure has been discovered in the Hayu Marca mountain region of Southern Peru. 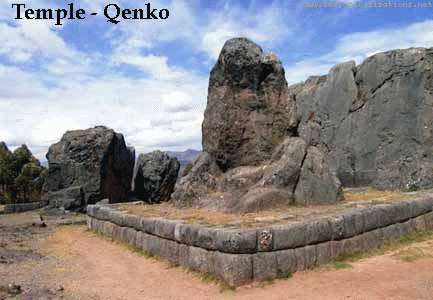 Hayu Marca, 35 kilometres from the city of Puno has long been revered by local indians as the City of the Gods. It has never been fully explored because of the rugged mountain terrain. Although no actual city has ever been discovered, many of the rock formations of the region resemble buildings and artificial structures. 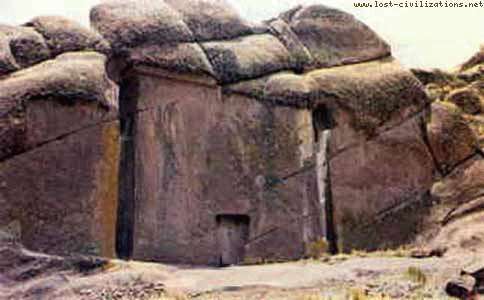 The door, or the Puerta de Hayu Marca (Gate of the gods/spirits) has been at some time in the distant past carved out of a natural rock face and in all measures exactly seven meters in height by seven meters in width with a smaller alcove in the center at the base, which measures in at just under two meters in height. Jose Luis Delgado Mamani stumbled across the structure while trekking through the surrounding foothills trying to familiarize himself with the area as his job is as a guide for mountaineering tourists. "I have dreamed of such a construction repeatedly over the years, but in the dream the path to the door was paved with pink marble, and with pink marble statues lining either side of the path. In the dream, I also saw that the smaller door was open and there was a brilliant blue light coming from what looked like a shimmering tunnel. I have commented to my family many times about these dreams, and so when I finally gazed upon the doorway, it was like a revelation from God. How do you make order of such a strange occurrence?" A gateway to the lands of the gods - In that legend it was said that in times long past, great heroes had gone to join their gods and passed through the gate for a glorious new life of immortality, and on rare occasions those men returned for a short time with their gods to inspect all the lands in the kingdom through the gate. Another legend tells of the time when the Spanish Conquistadors arrived in Peru, and looted gold and precious stones from the Inca tribes - and one Incan priest of the temple of the seven rays named Aramu Maru fled from his temple with a sacred golden disk known as The Key of the Gods of the Seven Rays. He hid in the mountains of Hayu Marca. He eventually came upon the doorway which was being watched by shaman priests. He showed them the key of the gods and a ritual was performed with the conclusion of a magical occurrence initiated by the golden disk which opened the portal, and according to the legend blue light did emanate from a tunnel inside. The priest Aramu Maru handed the golden disk to the shamen and then passed through the portal never to be seen again. 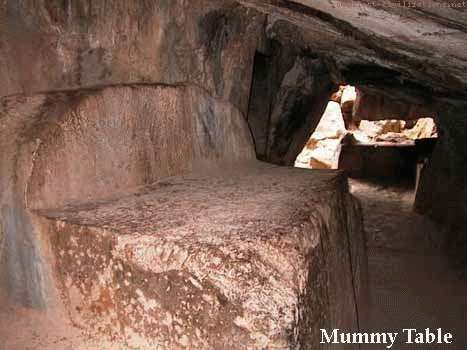 Archeologists have observed a small hand sized circular depression on the right hand side of the small entranceway, and have theorized that this is where a small disk could be placed and held by the rock.